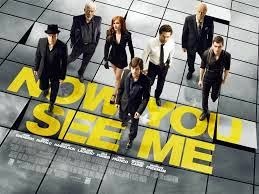 Now You See Me is the most tricky movie in the recent past. If you try to expect the proximate scene,you would fizzle for sure. Mentalist was impressive after 2012. Everyone did their best. I think we don't need to talk about Morgan Freeman. He always stands on the top of all actors across all "woods". Don't try to find the logic behind the tricks. They may trick YOU. Be active.